Large corporations are no longer the primary target for hackers, making network security for small and mid-sized businesses more important than ever before. Ransomware has evolved dramatically over the last few years, but one thing remains the same: it can wreak havoc the likes of which many businesses will never recover from. Join Ben Brobak, Technical Product Manager, and Marc Laliberte, Information Security Analyst, as they take a look at the evolution of Ransomware – and the best ways for businesses to protect themselves. The healthcare industry is experiencing a surge in transformative new technologies, and introducing telemedicine, more networked devices (Internet of Medical Things), and increases in protected EMR transmissions over Wi-Fi to enable better treatment, productivity, and communication within healthcare facilities. While they contribute to better overall outcomes - they can also open the door to new cyber security risks that need to be addressed with comprehensive security measures. Join Director of Product Marketing, Tracy Hillstrom, and Director of Product Management, Ryan Orsi, as they review the risks and the strategies to protect privileged information and support your compliance activities in Healthcare. You'll learn how medical providers can defend against malware with a cyber security “Rx” that supports a healthy technology adoption plan for every healthcare organization. Being able to understand the posture of your customers’ network security is one thing, but being able to quickly take action to troubleshoot and resolve issues is what your customers really need. Learn how having the right visibility and reporting tools can take your managed security services business to the next level in the fourth installment of this webinar series. Simplicity and security can be a difficult balance for any business to tackle. When over 60% of all Internet connections occur over Wi-Fi, many companies are looking for a solution to new security challenges. Join WatchGuard Technologies Director of Product Management, Ryan Orsi and Product Marketing Manager, Milena Babayev-Gurvits, on December 6, 2017 for a look at your company’s biggest security hole and why you need to allocate a portion of your 2018 budget to Wi-Fi. We will also address the most recent Wi-Fi Key Reinstallation Attack "KRACK" and provide our recommendations on how to secure your Wi-Fi network today and into the future. Today, organizations of all sizes are under siege from an unceasing tide of malware as tens of millions of new malware samples are discovered every month. With ample security budgets, skilled security teams, and cutting-edge-at-a-cost technologies at their disposal, large enterprises are well-positioned to protect themselves against the deluge of malware knocking at their door. Yet malware presents especially daunting challenges for SMBs as they face the same threats as enterprises, but with far fewer resources at their disposal. Through threat correlation and scoring, SMBs have a powerful new way to detect and kill malware that other solutions miss. Providing layered security with multiple services working together is the only way to effectively prevent, detect, and respond to network security threats. Learn how to utilize all the functions of Unified Threat Management (UTM) to provide the managed security services your customers need. In an age where malicious ransomworms shut down hospitals, sneaky nation-state malware disrupts international shipping companies, and banks lose tens of millions to network breaches, to protect themselves, organizations MUST stay current on the adversary’s latest attack techniques, tools, and trends. With in-depth threat analysis from the Firebox Feed – a network of more than 33,500 UTM appliances across the world – the Threat Lab team delivers insight into the big security stories making headlines, and the key solutions for defense. Join the Threat Lab’s Corey Nachreiner and Marc Laliberte on October 26 as they share their latest findings and the tips you need to defend your network. When managing security for multiple customers, you need easy to deploy and maintain solutions with the ability to integrate into existing technology ecosystems, supporting consolidation where possible with fewer tools, hardware, and service platforms. Learn how you can simplify your network security management in the second webinar of this four-part series. With the prevalence of social media and networking tools, consumers are always just a hop, skip, and a “click” away from leaving your business a glowing review or one that damages your reputation for weeks and months to come. But while factors like customer service have obvious influence on your business’s standing, have you considered the impact of your network security? You should. The consequences of network security vulnerabilities can cause devastating harm to a company’s brand, the likes of which some will never recover from. Retail businesses in particular remain a top target for cyber criminals – in fact, nearly one in three retailers have already suffered revenue losses due to a cyber attack. With your business’s reputation on the line, do you feel confident that you’ve really checked 'security' off your network shopping list? Join WatchGuard Technologies Director of Product Marketing, Tracy Hillstrom, on September 28 for a look at the top threats and trends impacting retail today, and the key solutions to protecting retail networks and reputations. The General Data Protection Regulation (GDPR) is comprehensive, critical to data security, and coming VERY soon. So, are you ready? Results from WatchGuard’s recent worldwide survey on GDPR readiness indicate that many businesses are waiting…but for what? Organizations with employees or customers in the EU must be GDPR compliant by May 25, 2018 or potentially face fines in the millions. With a laundry list of requirements and a diminishing window of time, prioritizing these compliance efforts have never been more important. The GDPR writing is on the wall for a panicky, last-minute rush to comply. Join WatchGuard Director of Product Marketing, Tracy Hillstrom, on September 14 for a crash course on the GDPR essentials and how to get started now towards compliance. Additionally, learn more about WatchGuard’s survey results so that you can assess whether you are ahead, on-track, or behind the curve. In the first webinar of this informative series, join WatchGuard and The Channel Company as they take an in-depth look at market trends and opportunities for value added resellers (VARs) transitioning to managed security service providers (MSSPs). The Threat Lab is a group of dedicated threat researchers committed to helping you stay ahead of the bad guys by providing in-depth analysis of the top security threats to your network. The team analyzes data from WatchGuard’s Firebox Feed, internal and partner threat intelligence, and a research honeynet, to provide insightful analysis about the top threats on the Internet. What types of malware do we catch most often in the wild? Which network services do attackers commonly target? What are the most popular attacks in different regions of the world? Join Corey Nachreiner, CTO, and Marc Laliberte, Information Security Threat Analyst, on July 26th as they explore their key findings from the first quarter of 2017. With everything from children’s toys to thermostats connecting to the Internet, it should come as no surprise that the average home has no less than seven IoT devices in use every day. But as pressure grows to release new products faster and faster, we’re all left to wonder: is security really a priority? Needing an answer, WatchGuard’s Threat Lab launched an ongoing project to test some of these connected devices and determine for ourselves how secure they really are. Join Marc Laliberte, information security threat analyst, and Ben Brobak, technical product manager, on June 29 as they analyze the surprising results of this project and share their best tips for defense. The global cyberattack that corrupted hundreds of thousands of computer systems on May 12th had a face, name, and price tag that we’ve seen all too often in recent years: Ransomware. With the stakes – and costs – of a ransomware attack higher than ever, is your business prepared and protected? Join WatchGuard and security training experts KnowBe4 on June 1st for an in-depth look at the best tactics for ransomware defense. Small and mid-sized businesses are a driving force behind cloud adoption, and it’s no wonder: cloud benefits are BIG, with substantial cost savings around hardware, software, paper, storage, and automations. But for all the convenience that moving to the cloud provides, where does security come into play? What steps should SMBs take to ensure their move is a safe one? Join Stephen Helm, product marketing manager, and Jason Vendramin, senior product manager, as they explore top cloud challenges, trends, and tips in this informative webinar. It's expected that by 2020, annual revenues around IoT solutions could exceed $470 billion. As all things IoT saturate the market (cars, tea kettles, toasters!) what does that mean from a security standpoint? What vulnerabilities aren't included in the fine print of these technologies? Join Ryan Orsi in episode three of our webinar series for a look at the current state of Wi-Fi Iot and what may lay ahead. During our previous episode, Anatomy of a Wi-Fi Hack, we took a deep dive into the who, what, where and how of wireless hacking. In episode two of this webinar series, WatchGuard's Ryan Orsi explores what measures can and should be taken to defend the Wi-Fi airspace around us. 565,000. Alarmingly, that’s the number of videos currently available on Youtube that explain how to execute a wireless attack. In less than a weekend, anyone with Internet access and some free time can become a Wi-Fi MiTM (Man in the Middle) and wreak havoc on your network. Join WatchGuard's Ryan Orsi in episode one of our three-part Secure Wi-Fi miniseries as he explores the motives, execution, and anatomy of a Wi-Fi hack. When cyber criminals lurk behind every dark corner of your network, where do you look for protection? Having disparate security solutions – from the network, endpoint, and threat intelligence feeds – is no longer enough. There needs to be correlation among these environments, or bad actors are certain to exploit your technology silos. Join Alexandra Lating, Senior Product Marketing Manager, and Marc Laliberte, Information Security Analyst, for a look at the key players needed to defend your network, but more importantly – what happens when you bring them together. Having the right security measures is a good start, but it’s only half the battle. You need a unified security front. You need Correlation. 2017 is sure to be marked by significant change and innovation within the world of technology. But as technology evolves, cyber threats are all too certain to follow suit. With our best crystal ball firmly in hand, WatchGuard is proud to present our 2017 Security Predictions. Join WatchGuard CTO Corey Nachreiner and his panel of security experts for an exciting, interactive discussion on the upcoming year in network security. They’ll take a look at the top security trends that are the basis for our predictions, along with some key tips and tricks for staying ahead of them. Over 90% of all breaches are enabled by a few hundred commercial exploit kits that hackers share and sell in the black market. The typical IT environment may have thousands of unpatched vulnerabilities, but at any given time, only a small handful of vulnerabilities are being actively exploited. To stay ahead of these attacks, WatchGuard participates in NSS exploit testing using CAWS (Cyber Advanced Warning System) - a cloud hosted software service that actively monitors and harvests live cyber threats and attacks, and then tests them against environments protected by the most widely used security solutions in the industry. Join Brendan Patterson, director of product management at WatchGuard, and Rob Johnson, sales engineer at NSS Labs, for a behind the scenes look at the CAWS test system, and how it helps enable WatchGuard to stop hackers in their tracks. WatchGuard Technologies, Inc. is a global leader of integrated, multi-function security solutions that combine industry-standard hardware, best-in-class security features, and policy-based visibility and management tools for every network, wired and wireless. WatchGuard provides easy-to-use but powerful protection to hundreds of thousands of businesses worldwide, from SMBs to large distributed enterprises. WatchGuard is headquartered in Seattle, Wash. with offices throughout North America, Europe, Asia Pacific, and Latin America. 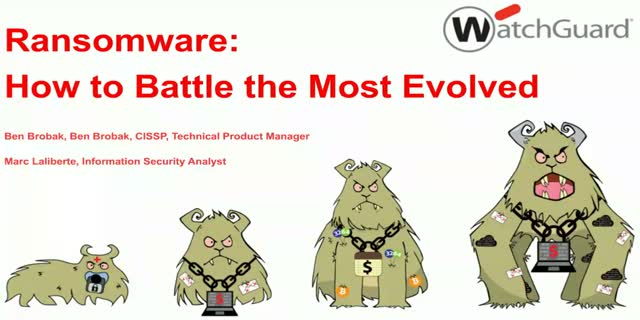 To learn more, visit us at WatchGuard.com.